Jerry Jones, executive director of the Community Health Council of Wyandotte County, talks about the virtues of collaboration as Mayor Mark Holland , to his right, and Tim Spilker, CEO of UnitedHealthcare Community Plan of Kansas, look on. Since the Affordable Care Act took effect, Wyandotte County has seen the number of its uninsured fall from 26 percent to 18 percent, one of the biggest drops in the country. But it’s one thing to boast of boosting the ranks of the insured, another to steer them through a complicated and, at times, bewildering health care system. With a $1.9 million grant from the United Health Foundation, announced today by county officials at the offices of the Community Health Council of Wyandotte County, the county is now in a better position to do that. The grant will pay for seven community health workers and a supervisor to help residents navigate the complexities of the system and reduce barriers to care. “It’s taking them through the process of, ‘O.K., you’ve got a health need, let me teach you how the system works, let me show you how to apply for your marketplace plan, or how to apply for Medicaid, or maybe there’s a job assistance program for you that helps you get the job that you need, which gets you access to health care,’” says Dennis Dunmyer, vice president of behavioral health and community programs at the Kansas City Care Clinic in Kansas City, Kansas. The clinic, which serves patients with and without insurance, has partnered with the Community Health Council of Wyandotte County to train and oversee the community health workers, who are already meeting with mainly low-income, underserved residents. Jerry Jones, executive director of the Community Health Council, says his organization sought the grant after the success of open enrollment under the Affordable Care Act gave way to a realization that there was a lack of health literacy among the newly insured. “And we just had an idea what it would look like to partner together to figure out how to make it as easy as possible for someone to find the health resources they need when they need it,” he says. The Unified Government of Wyandotte County/Kansas City, Kansas, launched a community-wide effort to improve residents’ health after the county was ranked last in health outcomes among Kansas’ 105 counties in a 2009 survey by the Robert Wood Johnson Foundation and the University of Wisconsin Population Health Institute. The survey came as a shock to a community that was just beginning to experience a mini-economic boom with new commercial development on its western edge. It led to the creation of Healthy Communities Wyandotte, which aims to tackle the impediments to better health, including poverty, unemployment and transportation. When it comes to standard measures of health, Kansas is a laggard. Whether we’re talking about obesity rates, incidence of diabetes, acute or chronic diseases, or childhood mortality, the Sunflower State typically ranks in the bottom half of state health rankings – and in recent years it’s been sinking even lower. That’s bad enough. But there are vast disparities within the state itself. Averages only give a rough-and-ready sense of the state’s overall health picture; dig deeper – down to the county level – and you’ll find that some counties actually perform quite well while others perform poorly. Unified Government of Wyandotte County/Kansas City, Kan.
A multimillion-dollar plan to transform downtown Kansas City, Kan., into a national model is one step closer to reality. The Unified Government Board of Commissioners last week unanimously approved a new master development plan designed to help improve the health of Kansas City and other Wyandotte County residents by providing a state-of-the-art community center, more green space in which to exercise and access to healthy foods at a 30,000- to 35,000-square-foot urban grocery store. 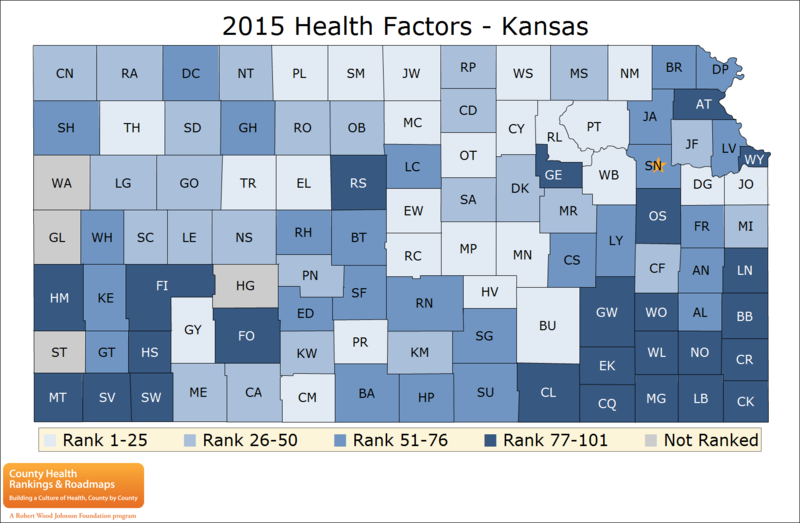 New county health rankings tell the same old story in Kansas. The southeastern corner of Kansas remains the state’s least healthy region, according to the rankings released Wednesday by the Robert Wood Johnson Foundation and the University of Wisconsin Population Health Institute. However, the Kansas county at the bottom of the list — Wyandotte — is next door to Johnson County, the state’s top performer. At her home studio in Westwood, Kansas, yoga instructor Marilyn Pace leads a class of 5-to-8-year olds. With the help of songs, games and other kid-friendly teaching methods, she guides her small students through poses like the cobra, the triangle and the downward-facing dog. Tatjana Alvegard takes her daughter, Kaya, to Pace’s classes regularly. “I played sports when I was a kid, and I think it’s really important. It makes for a good, healthy adult if you learn discipline and you learn it’s good to take care of your body,” Alvegard says. Can Restoring Parks Lead To Better Health In Wyandotte County? Take a Saturday morning bike ride along the Kansas side of the state line and you’ll see plenty of people playing tennis, soccer and jogging in Johnson County. Ride a bit farther north to Wyandotte County, though, and it’s clear that outdoor recreation is a much rarer phenomenon. On a map, the counties appear to have about the same amount of parks and recreational space. But over several decades, Wyandotte County’s parks fell into a state of neglect and disrepair – to the point of being ignored by many residents. Editor’s note: The video below, produced by KCPT Television, kicks off a five-part series called “Crossing to Health” that will run next week starting Monday. The series, by Heartland Health Monitor reporter Alex Smith, explores the health disparities between Wyandotte and Johnson counties and what’s being done to close the gap.